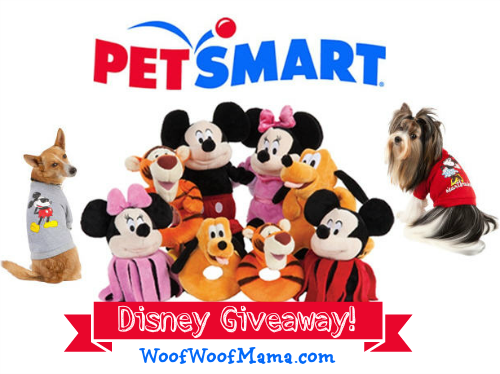 Giveaway: Capture the Magic with a Disney Prize Pack from PetSmart! 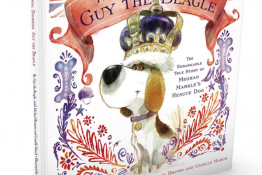 PetSmart is sharing some Disney magic with our readers by giving away a couple of prize packs with adorable dog apparel, accessories and toys featuring some favorite Disney characters! 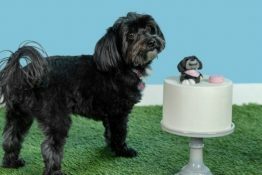 We recently shared photos and news about Daisy’s visit from Minnie Mouse, and now we want YOU to win some fun stuff from the PetSmart Disney line for dogs, too!!! 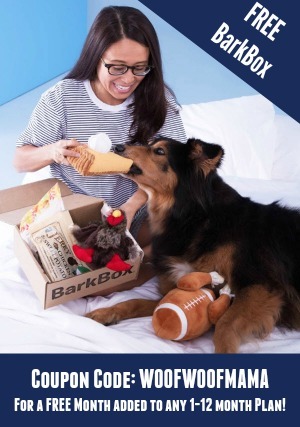 Win a Disney Prize Pack for Your Dog – 2 Winners! Two winners will each receive: a Disney dress or t-shirt (winner’s choice) plus a Disney bandana and Disney Dog toy. 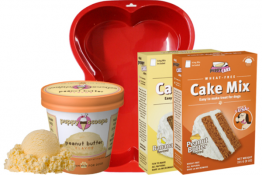 This giveaway runs thru April 1, 2013, is open to US residents age 18+ and uses the Rafflecopter Widget for FAST and EASY ENTRY! There are many OPTIONAL entry methods to give you additional chances to win, but just choose the ones you want. Email addresses and other info are only used to verify and contact the winner. Rest assured that your information will never be sold or shared with anyone. All entry methods are subject to verification. Please make sure you provide all required information or your entries won’t count! Void where prohibited by law and not affiliated with Twitter, Pinterest or Instagram in any way. Sponsor is responsible for all prize fulfillment. Mickey Mouse 🙂 I would love to win this for my dogs, Cinnamon & Sugar. Love me some tigger cuz he’s the only one! So many disney characters to live! Todd, peter pan, mulan etc. love them all, great giveaway thank you! My favorite for my dog Sissy is Minnie Mouse. I actually brought back a dog toy from Disney World for her and it is shaped like mickey’s head and pink. She’d love to have this. I love to win Minnie for my dog Bagel. Thanks for this giveaway. I’m a Plut fan, and both my pugs Rosie and Vinnie have to share. My favorite character is Minnie and Rocket, our rescued pibble, would receive the prize. Thanks! I’d pick the Donald Duck T-shirt for my dog Bailen. My favorite character is Goofy. I’d love the prize for my dogs, Frosty and Scarlett. I like Minnie. Maggie is our dog that would win this prize. My favorite is Minnie Mouse and my Dog Roxie would get the prize! Mickey Mouse has always been my favorite Disney character. Coco Chanel Bella, my 7 year old cocker spaniel would be receiving the prize! My favorite has always been the original chacter Mickey Mouse. I am entering to win this for my dog Sugar ahe is the light of our families life! for my mom’s dog Sidney the Beagle .. thank you! I love Goofy and this would be for my sweet little poodle, Zuzu!! Goofy & Pluto are the best! My favorite Disney character is Pluto and Artie will be the dog who will receive the prize if we win. My favorite is Tigger and my dogs name is Einstein. Thanks for a great contest!! Schooner and Skipper would love to have Pluto! I love Goofy. My dog, Sushi would get this prize. I like Pluto and my dog Gizmo will receive the prize pack. Pluto and Goofy are my favorites. This would be for our new puppy, Gunnar. My rescue dog Roxie is a great travel companion – she would love to go see Minnie Mouse! Tigger is my favorite…..I even had a tigger….a red pit bull but he’s waiting at the rainbow bridge…..my rescue pit bull now is named blue….. I have eight dogs, three of which are rescues…. I like tigger the best and Pluto of course since he’s a dog! Lol. I do have a MInnie here and she will get to share the prize pack with her friends…. Thanks for the chance to win. 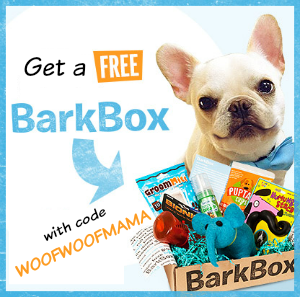 My doggies would absolutely love to win this prize package and they would all share the toys and several of my dogs love wearing bandanas currently so would love to have a new one….and the clothes would be fun! Thanks for the chance to win! Hi Linda! You can see the 2 winners announced on the Rafflecopter contest widget above. Sorry you didn’t win this one but be sure to checkout our current giveaway for the Natural Balance gift basket!